Warren Buffett. Benjamin Graham. Peter Lynch. Philip Fisher. George Soros. 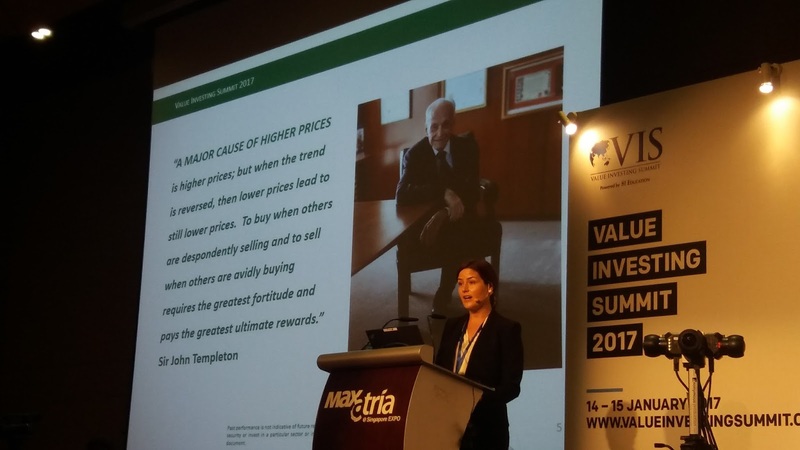 John Templeton. 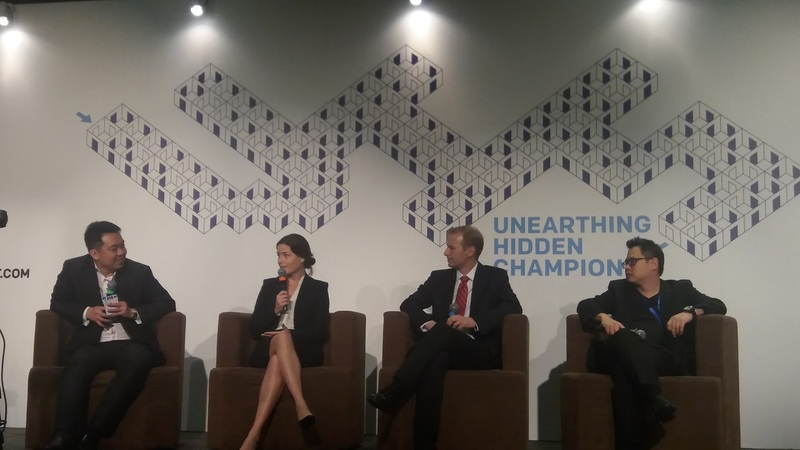 Where are the females among the world's most recognised investment legends? A look at Investopedia's list of the world's greatest investors shows that there's none. Among the money managers, only 2% of hedge funds are run by women, although a large percentage of them are in the top performers of the last 10 years. One of them is Lauren Templeton. As the great-niece of respected investor Sir John Mark Templeton, Lauren grew up learning about investing as a young girl, and benefited personally from her Uncle John, whom she described as "strict but very kind" whenever he taught her. She shared about how she used to have really weird meeting appointments scheduled with him, such as from 2.17pm to 2.48pm, and that the atmosphere was really tense because she could just feel the limited time she had with him. On one occasion during a meeting with him, he slid across her printed presentation slides across the table and said, "I've already read them. What new information have you got for me?" Sir Templeton was known for his impressive track record over many years, especially during the 1939 crisis when Hitler was attacking Europe. Templeton borrowed $10,000 and bought $100 of every stock (104 in total) trading below $1 on the New York and American stock exchanges. Four years later, he sold the stocks for more than $40,000, with some stocks having gone up by as much as 12,500%! Growing up with an investment legend for an uncle certainly had a huge influence on Lauren Templeton. 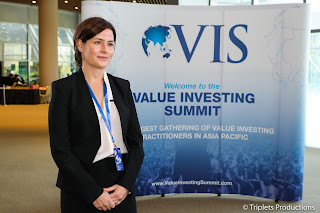 Today, she runs the boutique value investing firm Templeton & Phillips Capital Management with her husband, which focuses on bargain stocks around the world - similar to the style of investing which Sir Templeton pioneered. 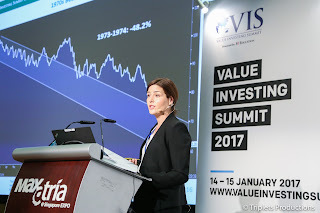 "Most successful value investors have the capacity to suffer greatly, and be in uncomfortable situations for a long period of time". The key to successful investing, she said, is to never panic in a crisis. The best investors are those who are able to overcome their psychological biases to take the right action when the time comes. "Your behaviour in bear markets will determine your lifetime results". Unfortunately, humans are biologically hardwired to respond in emotional ways, and that is what often stops the average investor from doing well. "Risk is paying too much for a stock". 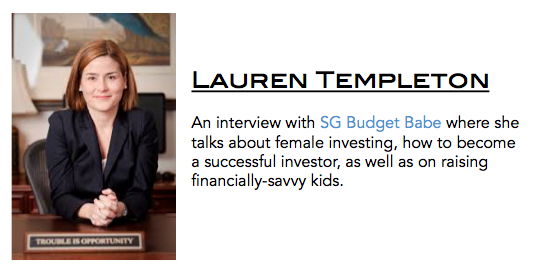 I also got the opportunity to interview Lauren for the blog while we chatted about the scarcity of females in the investment scene. As a role model for female investors worldwide, Lauren talked about female vs. male styles of investing, raising financially-savvy kids, and more. 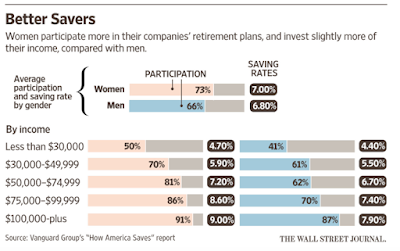 BB: Do you feel that there are any differences in the way females invest versus men? 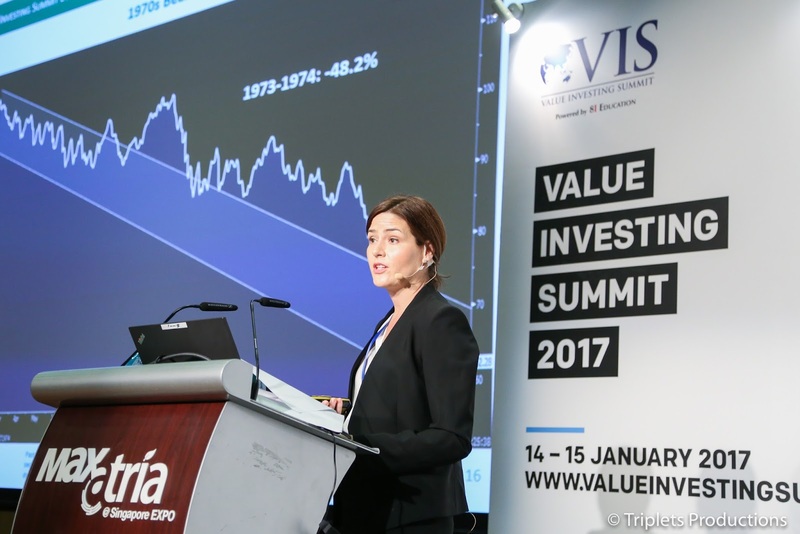 But generally speaking, women tend to be more risk-adverse, which usually tends to lead to a lower portfolio turnover as they trade lesser positions. 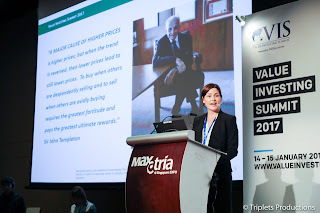 Research has also shown that women tend to have better investments returns due to the lower transaction costs. Some men also tend to be over-confident, which can cause them to have poorer investment returns as compared to women. BB: I noticed that many females are worried about investing due to a fear of math. This was my personal story as well - math was my greatest enemy in school, and I absolutely abhorred it. It took me a long time to pick up the numbers in investing. What has your experience been like? L: I didn't major in finance or business - I did economics, and it was a good foundation. Although my mom was a math teacher, you don't have to necessarily have a background in mathematics before you can invest. There are books and resources where you can learn how to read a company's financial statements, and you don't have to be good in math to do that. BB: Women sometimes tend to be more emotional than men. Any advice on how we can overcome this in investing? L: Take charge of your emotions. I recommend reading books on behavioural finance, such as The Little Book of Behavioral Investing by James Montier. Once you become more familiar with the concepts, you'll become more self-aware of your own psychological that might affect your investing. 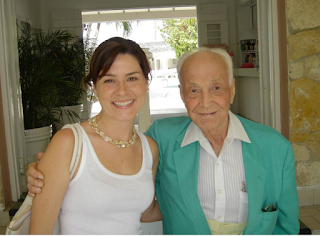 When I first started managing our fund, my Uncle John had a system that had rules on when and what to buy, and it was important to "save me from myself", so that I wouldn't fall prey to my own emotions. The best way to learn? 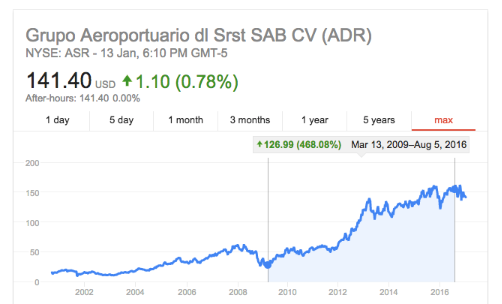 Put your own money into the stock markets! I always think you need to lose some of your own money before you realise what stops you from being a successful investor. Experiencing the loss of my own money after college was one of the best investing lessons I've ever learned. "The more you save, the more you have to invest". BB: How did you allocate your portfolio of cash such that you wouldn't run out during the crisis? 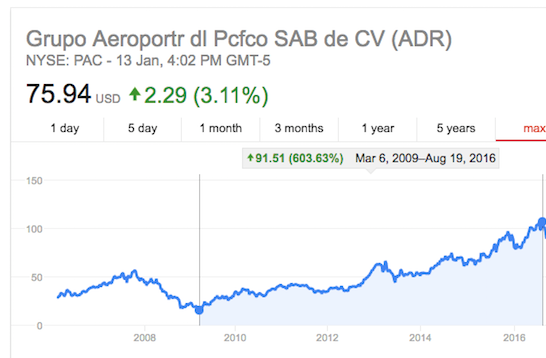 Did you average down on each stock over a period of time, or purchased each stock only once? 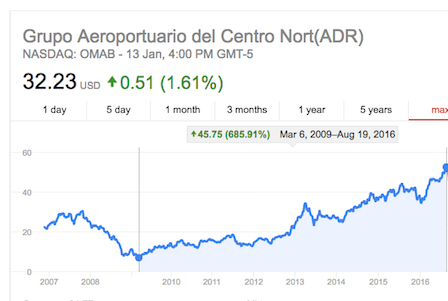 L: We started buying months before the market bottomed during the Global Financial Crisis. There was no way we could have known when the bottom would be. At some point, we did run out of cash. But we prioritised our purchases. We maintained a spreadsheet of about 12 stocks on our watch list which tracked how much of a discount they were trading to their intrinsic value, ranked from those trading at the lowest discount to the highest discount to their intrinsic value. We try to look for stocks that have a minimum of 50% discount during a crisis, and we bought those which had bigger upside. We would move our funds based on the upside i.e. if a stock we were already in had moved up from a 60% discount to a 20% discount, and there was another stock trading at a 50% discount, we would sell the first and shift our funds over to the one with a higher upside. It wasn't just about the cash, it was also about the opportunity cost. 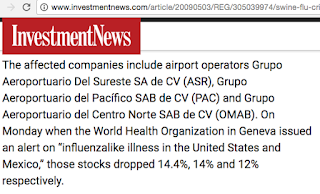 I didn't manage to ask Lauren if they've held onto the stocks till today, but here's a look at the spectacular rise of the Mexican airline stocks after the swine flu scare. Regardless of whether they've already sold or are continuing to hold onto the stocks, the returns are staggering. BB: You adopt a "maximum pessimism" strategy to succeed. How can we, as retail investors, minimise our risks in the stocks that we pick during such periods of crisis? L: You can identify crisis periods as times when you feel really scared. You don't have to be the best stock picker during such times. What matters is that you put your money to work at these periods. My Uncle John was described by many to be the greatest stock picker in the world, but he told me that he was right only 60% of the time! 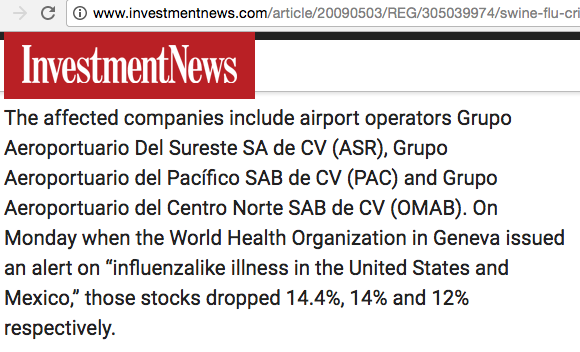 To be honest, during the swine flu crisis, we invested in a basket of Mexican airport operators. We didn't have time to research - call up their management, look at competitors, study their numbers, etc - so we bought a whole basket of them. And it paid off. Focus only on quality businesses. To avoid liquidation risks, look for companies with healthy balance sheets and minimum debt. These are less likely to go bankrupt. Pick a strategy, and stick to it. Lauren also talked extensively about how she's raising her kids to become financially-savvy, hoping that they'll become good investors in time to come as well. I'll detail her parenting methods in a later post, so stay tuned! Me too, I've lots to learn on the psychology behind investing as well!